The Mini Dragon Glassblowing Furnace Kit! Price is current as of February 2019 and subject to change without notice. ​Crating is included in the kit price for orders shipped in the continental United States. Shipping is not included in the price. International orders may be subject to additional crating fees based on destination. With the Mini Dragon and CAT-60 annealing tube, you can produce hundreds of ornaments and never run out of annealing space! Stand pictured is a custom All-Terrain option. 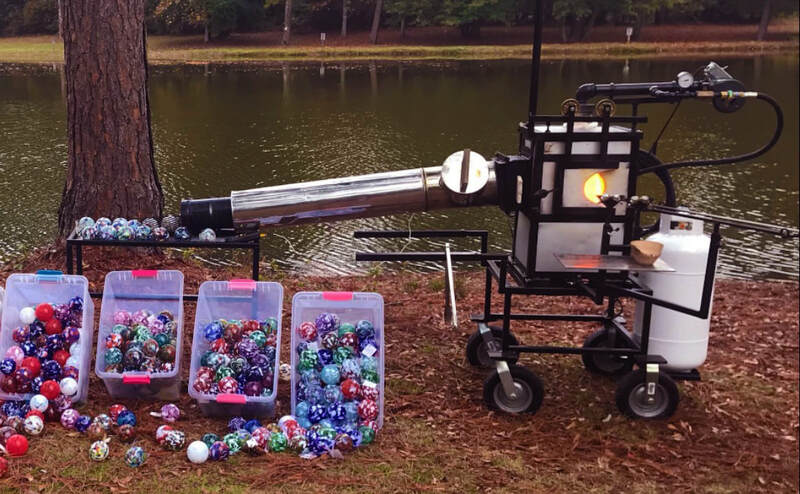 ​The Mini Dragon is the most portable and affordable glass furnace/glory hole combo on the market today. This is a serious tool that is a lot of fun to use. ﻿The Mini Dragon fits in the back of your hatchback, station wagon, SUV, van, or pickup. Hot in about 3 hours! Blow all day using just a BBQ tank. Burner Train with Proof of Air Safety System. Standard Finish: powder coated steel frame and hand applied dragon scale textured stainless steel panels.